@No Tricks Zone: Arctic Ice Gain Embarr­asses Global Warming Scient­ists. 40-​Year Meteoro­logist: “Don’t Be Surprised Over What Happens Next 10-​15 Years! @American Elephants: He is Risen! Happy Easter! Eliza Grisw­old’s book Amity and Prospe­rity: One Family and the Fract­uring of America examines the impacts of fracking in western Pennsyl­vania, and on Monday it was awarded the Pulitzer Prize in General Nonfic­tion. @Tallbloke's Talkshop: Was This The BBC’s Worst Climate Show Ever? @Science Skeptical: Klimat­error in Londen zu den Oster-​Feiert­agen! 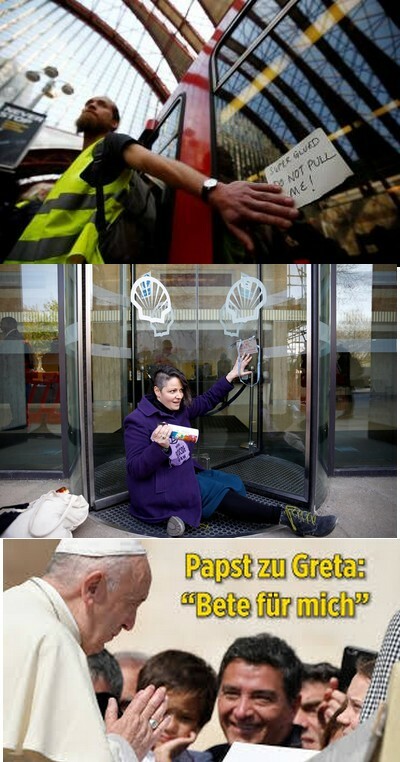 Im Zuge der Proteste um Gerat Thunberg beim Papst in Rom, gab es in London nun auch zu Ostern Proteste von Umwelt und Klimaakt­ivisten. @Climate Scam (Swedish): Går klimatf­örändri­ngarna allt snabbare? A couple of videos about rotating space stations, the design issues, and one that is being promoted for building Real Soon Now. The Reserve Bank of Australia joins climate alarmists – Climate Change and the Economy – must be antici­pating the near certainty of a Green­Labor election win next month. @Real Science: April 22 : Earth Day!